Our priority is to seek urgent government action on developing a Scottish upland landscape vision and policy, a process through which stakeholders can come together to influence priorities for Scotland�s uplands. We see the risk of not doing this being fragmented decision-making at a local and national level which fails to protect and respect Scotland�s mountain landscapes and wildlife. If an example of an uncoordinated approach to planning is needed, look no further than the proliferation of wind farms in mountain and wild land areas, where Scottish Government policy on spatial planning has been sadly lacking. In calling for an upland landscape vision and policy, we have highlighted one aspect of land use that we feel needs consideration at a strategic or policy level � the growth of commercial forestry. This does not mean we are against new planting, and we are in favour of native species. This reflects the views of our members as 94% who responded to a survey said we should campaign for the growth of native woodland and conservation of Scotland�s iconic Caledonian pine forests. However 65% of Mountaineering Scotland members who responded felt there was a need to reduce the impact of commercial forestry. With government targets for 10,000 new hectares of planting each year by 2022, we think this needs detailed consideration of the impact it may have on landscape and access by relevant stakeholders. Comment has been made on our cooperation with the Scottish Gamekeepers Association. We adopted this approach because both organisations felt that collaboration on a single issue by organisations who are usually perceived as having opposing views would emphasise to the Scottish Government that there is significant support for the development of a holistic landscape policy. We disagree with the SGA on a number of issues, but both our organisations are completely in agreement that a Scottish upland landscape vision and policy is needed. We will continue to reflect the opinions of our members in future exchanges with them and believe that our present dialogue will enable us to promote our members views on a more direct basis. This summer we will be launching a consultation with our members and a spectrum of interested organisations, on the development of a new conservation policy which will set out Mountaineering Scotland�s priorities on a range of landscape and conservation themes, and our strategy for campaigning and achieving progress on these matters. The joint press release issued from Mountaineering Scotland and Scottish Gamekeepers Association can be read here. The joint letter to Roseanna Cunningham can be read here. 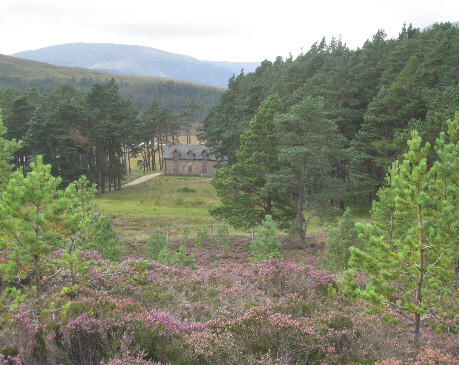 New tree growth with old on Mar Lodge Estate.